It seems to me that much of our religious vocabulary, defined many times within the past 500 years, is enculturated to speak a two-storey world (see the previous post for an explanation of two-storey world). Words such as “faith,” “believe,” and their relatives belong somehow to a portion of the world that is not first-storey. They are keys to the second storey, and are therefore unconvincing to the ultimate modern one-storey folk, the atheists. The abstracted notions of “imputed righteousness,” when the meaning is something other than an actual reality within the person of whom we are speaking (imputed, as in “in the mind of God”) are tailor-made for a two-storey world. It is little wonder that much religious discourse takes place in the abstracted world of the second-storey. Much doctrinal discussion is little more than moving around air (or digital events) and not about anything that someone is actually doing. There are plenty of hucksters on the first floor, who make false claims and boast of false gifts. Televangelists playing “baseball” with the Holy Spirit, as if God were a ball of energy to be hurled across the stage at so many bowling-pin believers. This is silliness, driven by our desperation for the marriage of the first and second storey. Such hunger will always produce false prophets. Simon Magus was only the first in a long line. So for the moment I will leave a question (I do plan to return and suggest some answers): what should religious language look like if it is not the language of a two-storey universe? What do words mean in a one storey universe? 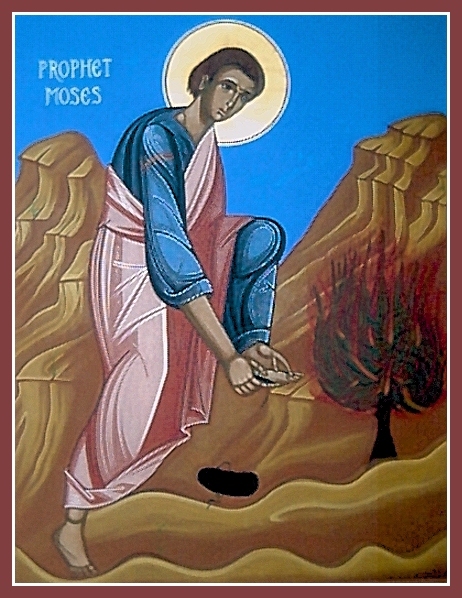 The icon is of Moses at the burning bush. His story seems clearly to belong to something other than a two-storey universe. But I’ll say more later. If N. T. Wright is to be a guide here, our language should be that of New Creation “breaking in” and future consummation being anticipated in the present. For instance, in the Eucharist, we are linked back in symbol and mystical reality to real events, with Christ and his disciples in the upper room, and with him on the cross on Calvary. We are also acting in anticipation of that great feast where we will eat with all of the Saints in the kingdom of God. Neither of these events – the future or the past – are second story. And the real actions of eating and drinking are first story as well. But the spiritual power that flows between them – the past and the future rushing into the present – is invisible to the atheist. No one is far away. Everything is near. Love is inevitable. Scarcity is nonexistent. That’s my guess. I think the past and future stuff is still second storey. Forgive me, but I’m just not an N.T.Wright fan. Kind of wannabe conservative but not really. I am curious whether your negative opinion of him is based on his scholarship, or some of his peripheral views (e.g. women’s ordination). I disagree with him on women’s ordination, but find his biblical scholarship some of the most insightful I’ve ever read. I think his scholarship is middle protestant (I coined a term I’m not sure what I mean). I suppose it looks daring in the West for someone to suggest that Luther didn’t read St. Paul correctly on justification – but if one had read the Eastern Fathers they never would have thought otherwise. In that sense I find his scholarship as way too little way too late. It’s slightly timid where I think he could be bold, and in the deteriorating Anglican context, almost beside the point. That he supports women’s ordination just says that he’s part of the general Anglican mix. One of the things that occurs, I think, after immersion for a time in Orthodox thought is that St. Paul ceases to sound like a Protestant (it would be weirdly anachronistic for him to sound like one in the first place). The cadences of Protestantism are simply absent in the ancient Church, including the New Testament. But it takes some time away from all that to hear the “voice” of Scripture. I think it takes reading much more material contemporary to St. Paul, and to see what the first four or five centuries do with him. The context of St. Paul is probably closer to that of St. Isaac of Syria than to that of Luther (that’s pretty easy), not that I’m suggesting that St. Isaac is the great interpreter of St. Paul. Simply that he is a semitic Christian of the early Church. Christians who have the ability should be reading the Fathers, not N.T. Wright, if I had to make a choice. Not that Wright shouldn’t be read. But if the major fathers of the first five or six centuries are strangers to your reading, then you really have no basis on which to judge Wright’s work (or any other modern for that matter – including what I write in my blog). Oddly – C.S.Lewis said all this quite well in his little introduction to St. Athanasius’ De Incarnatione. But I find Lewis is enjoyed more than he is obeyed. I can testify about the “hearing” of the scriptures. After being out of the evangelical mix for two years one begins to read the scriptures in a different light. Now when I read I sometime say that is not what it says, then I go to my old study Bible from my evangelical days and look it up, yup, it says that. I missed so much for so many years due to the scales that clouded my vision. The scriptures are so much vibrant today than they ever were. By second storey I mean to describe something quite removed from our life – a concept largely invented in Western and modern thought that has removed God from the world in which we live (and in turn created a crisis of belief for many). The fact that the reality we see has an inner reality is not second storey, but largely in agreement with Orthodox thought. I note that you are a Sufi. There are a number of common points of agreement between Sufi’s and Orthodox, though I am not well enough read on the topic to make much comment. 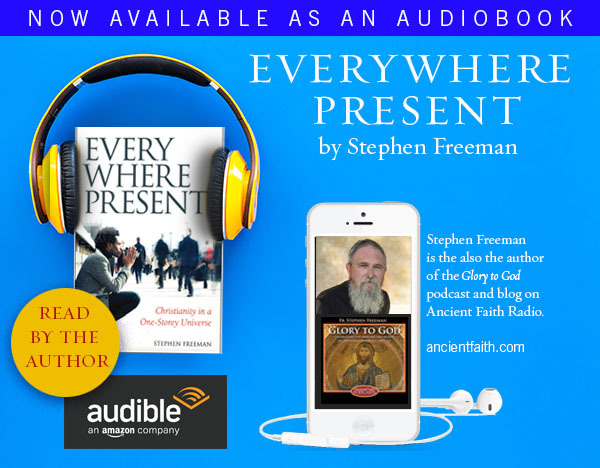 I listened to tapes of a conference where Bishop Kallistos Ware (of England) was having conversation with a noted Sufi and both agreed on a number of points. Historically, there was contact between the two. However, I can only speak from within Orthodox thought and am not entirely comfortable with thought from another religious tradition. But thank you for your comment. I can only offer this insight (forgive my childish simplicity which borders on cliche). We would not come to know about God. We would come to know God. Two wonderful posts, sir. I have no desire to argue or pick a fight, but I would appreciate your honest opinion here. Do you think that the two-story worldview is intrinsic to Theological Protestantism. I use this term to distinguish it from your defined term of secular Protestantism. Secondly, I think it is interesting that Francis Schaeffer, who was very much a Protestant, also wrote against the two-story worldview. Much of what you have written here is similar to what he wrote, in my opinion. Thirdly, you made a veiled reference to Luther’s work. I think Luther was perhaps a little crazy, but I find the core issue of Theologia Crucis to be brilliant. That the Hidden God is seen in the Crucified God has been a deep source of “food for thought” for me recently. And I wonder if the identified problem of the two-story worldview is solved at this point. However, some of the abstractions that come from this center piece do make me a little nervous. I do not think that a two-storey universe is intrinsic to theological protestantism, though you’re asking me about something that runs from Luther to Paul Tillich. It’s intrinsic to some of it, certainly. And, in some cases, the anti-sacramental character of some Protestant thought is particularly vulnerable to two-storey ideas. Schaeffer does speak about it – rightly seeing the problem, though his only answer was Biblical inerrancy, as I recall. It’s too small an answer. Luther, I will confess, is someone whom I like. He’s both a medieval and a modern man, but clearly a pious beilever, whatever his shortcoming. I agree his thought on the Crucified God is deeply worth time to consider. That has been my biggest problem – i.e., I continue to read St. Paul through the lens of my former Protestantism. I continue to see sola fida justification theology when I read, e.g., Romans and Galatians, even though long before I became Orthodox I read Hendrikus Boers’ The Justification of the Gentiles in which he argues from a discourse analysis reading of Romans and Galatians that “justification by faith” is NOT Paul’s main point, or maybe not even his point at all. But slowly, slowly, the liturgy and prayers are stripping away my old clothes and dressing me in new ones, thus helping me to see things differently (to mix metaphors). what should religious language look like if it is not the language of a two-storey universe? If I may be so bold, perhaps the question was not put as well as it could be. I should ask not what language should look like so much as what it should sound like. And if the question is put in that way, I should suggest that it should sound like the Church’s liturgy; that is, like the Scriptures as they are proclaimed and prayed in the liturgical assembly. There is nothing “two-storey” about Christ is risen from the dead, trampling down death by death, and upon those in the tombs bestowing life!. It is all present tense, and it is not about “God up there” or about “going to heaven,” but about the transformation of those who are all on one “storey”. That, I think, is our model of language. Well put – better than my first clumsy effort. Excellent post. I was also going to say (before someone above said it!) that it’s the ‘words of the liturgy’ which are the ‘sound’ of a one storey universe – ‘This is my body….’ meaning both/and not either/or. I would say that he has been the single most important influence in ‘pulling’ me out of conservative evangelicalism and setting me on the sacramental path which is leading towards Orthodoxy. For me the great strength of his work was to encourage me to read the NT through the perspective of a 1st centuary 2nd temple Jew. Doing so strips ones hermenutical lens of a lot of the western rationalism which contaminates biblical interpretation. The challenge is, then, to see how this Jewish paradigm (which was fully sacramental) is carved out within Hellenistic philosophical language so that we have the language (and doctrines) of the early Church. It’s like a computer that is starting to run lots of errors…sometimes all one can do is to restart it and allow it to reboot. Orthodoxy is like an Applemac – never going wrong (! ), however for ‘Windows XP’ Protestants who have got themselves into a non-sacramental, reformed-forensic, cul-de-sac of a paradigm, N T Wright has been instrumental in instigating a ‘re-boot’. Of course, once one starts to think more like the early Church it doesn’t take long until one realises that Orthodoxy still transmits this thought-form and ‘voila!’, another convert is in the making. My youngest daughter, a confirmed Mac user, would like your analogy a lot. I have to confess to not having read as deeply in Wright as many (though I did edit an article of his some years ago in a book I did – long ago and far away). I recall his was a very warm gentleman – he was a Cathedral Dean at the time. I enjoyed my association with him. I’m glad he helped you to reboot! However, I can only speak from within Orthodox thought and am not entirely comfortable with thought from another religious tradition. Could you expand on what you mean by that? Do you mean you’re not well-up on it, or that it makes you uncomfortable? I find it comforting and enlightening that there are many congruencies between Orthodoxy, Sufism, Buddhism, Taoism, neoPaganism, etc. I find it helpful, if I can’t understand an idea in Christianity, to use a similar idea from another tradition as an analogy. The fact that some ideas are universal makes them all the more likely to be true. Yvonne, it means both that I’m not well up on other things, and that I respect other things enough to know that you can’t get well up on anything from the outside. I am an Orthodox Christian and I live an Orthodox life (by God’s help and poorly enough at that). 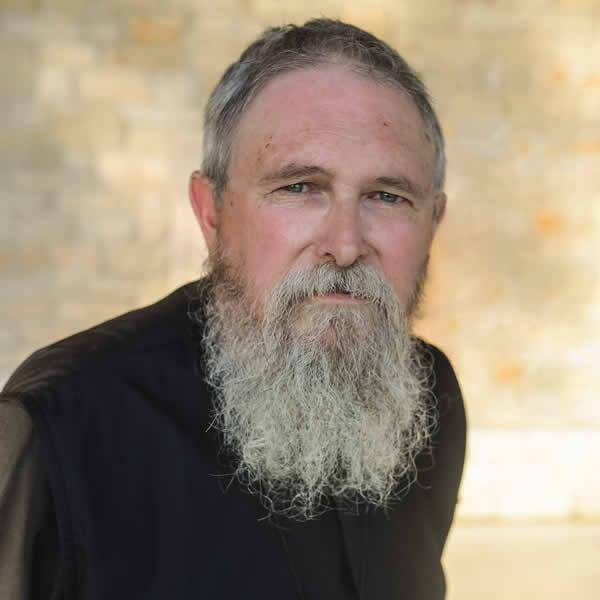 I serve as an Orthodox priest. What I know and can speak is only what I live. We Americans (Westerners) treat religious traditions like aisles in a grocery store, and yet remain shoppers of everything. That there are congruences I do not doubt, God is very merciful. But I believe in Christ and the Truth as revealed by Him. My life is to become that by submitting and living it, not by taking a bit here and a bit there. Think of the meaning, “To become Orthodox,” and it’ll come to you. It’s not something you join, it’s something you become. Hello Father Stephen, I am not suggesting that being a shopper of everything is a good thing, but it so happens that I have read a lot in other traditions and find them useful as a corrective to the Protestant world-view (specifically Plymouth Brethrenism) in which I was brought up until the age of nine, and which makes it difficult to read the Bible without hearing the words in a Protestant way. I fully appreciate and applaud your deep understanding of Orthodoxy, I find it very nourishing. And I like your answer to my question. Yvonne, thank you for your reply, it clarifies a bit. You will have taken a very interesting journey to Orthodoxy, but that’s true for a lot of us. I understand the comparisons and understand that their helpful. I’m also glad that you understand about immersion – we only know by becoming. It will also, over time, mean some things will pass away, you won’t need them. I only know very cursory things about Wicca, but since, as you say, it’s a new “tradition” largely invented in the late 20th century, I haven’t given it much thought. Mostly, I’ve thought that if people actually want to know the truth they need to turn to something that has true knowledge, and a means to heal us. May God give you much grace. If you’re interested, the books to read would be Ronald Hutton’s “The Triumph of the Moon” which traces Wiccan ideas back through earlier discourses and shows where they come from (late antiquity, some medieval ideas about Nature, and 19th century Romanticism); and Jo Pearson’s recent “Wicca: the Christian Heritage” which I haven’t read yet. Believe it or not, there is much in proper initiatory Wicca that is reminiscent of Orthodoxy. Sadly, there is a lack of coherence caused by a lack of a perceived need for coherence. As with anything, ideas don’t pop out of nowhere, and I think the emergence of neoPaganism can be explained quite easily by the promulgation of the idea of the two-storey universe. NeoPagans also believe in a one-storey universe. I think you’re quite correct about neopaganism being a reaction to the two storey universe. It’s just incorrect in many ways. For one, you can’t revive a tradition that’s been dead that long. You just invent stuff for yourself. We don’t have that kind of knowledge. We find ourselves manipulating symbols that, in Lewis’ words, may bring Deep Heaven down upon our heads. I hope and pray that the Divine responds (out of great mercy, in the sense of eleison, and goodness) to all who truly call. “Who among you would give his son a stone if he asked for bread, or a serpent if he asked for a fish?” I also find Lewis’s story of Emeth helpful in this context. I know that I wouldn’t have been able to rid myself of the errors of extreme Protestantism without journeying via Paganism and Wicca, and I believe the Divine does speak to Wiccans and others. Nevertheless, for many reasons (especially the throwing out of the baby with the bathwater in reaction to Western Christianity), much of contemporary Paganism is out of balance in many ways, though there are many honourable exceptions to that. It also lacks a soteriology and an eschatology and a theodicy – partly because it is convinced you don’t need them – but as evil exists in the world, there must be an explanation of how it got there, and how this will be put right. One cannot just ignore it and pretend it’s not happening. And if one tries to pick and choose bits and pieces, one may reject something which is difficult but needful for the healing of the soul. As long as contact with the Divine remains, there is hope and truth – but when that is lost, it all falls apart. Indeed. I think your assessment of paganism is on the mark. It is indeed interesting how many roads we all travel particularly to come to a similar place. God is indeed merciful to one and all. This is probably a bad place to post this but I could not find a thread dealing with questions about the Divine Liturgy and my questions deal with the understanding of language used at least. I attended the Divine Liturgy with a protestant friend yesterday and he asked a couple questions about some of the liturgy that I am not confident in my ability to answer and hope to be able to understand more fully. One referred to when it is prayed “For our deliverance from all tribulation, wrath, danger, and necessity,” What exactly is meant by deliverance from necessity and how is it connected with tribulation wrath and danger? The second was on the meaning behind “the King of all, who comes invisibly upborne by the Angelic Hosts. Alleluia, alleluia, alleluia.” specifically the upborne by the angelic hosts part. It may be that the meanings ought to be obvious but there are many times that I miss the obvious and would appreciate any illumination you may shed on these meanings for me. Necessity – means having fallen into any distress which has forced necessity on you. Such as poverty. The second – refers to the image of the Lord being borne on the wings of the angels (in this case literally in the procession of the gifts to the altar). I’m looking for the Bible reference – may have it shortly. so then in the first case, is it deliverence from the necessity (real or perceived?) that may lead us to deeds unworthy of one united to Christ or is there something else to it I am missing? and connected to the second, I think… in the Cherubic hymn when we “mystically represent the cherubim”, is it a statement that as the Cherubim hold up the Christ in the heavens, the Church mystically holds up the image of Christ on earth? and if this is so would it be appropriate to say that the Church, which by definition includes the saints, is in communion not only with the Trinity but also with the cherubim and even potentially all the angelic hosts or is that going too far. Yes, it similar to the petition “and lead us not into temptation” which literally, in the Greek, means not to let us suffer trials. We know that there will be trials, but we ask for mercy. The image is that of a procession, of bearing Christ up “on our wings.” We are making a “heavenly procession” as we enter the altar bearing the gifts of bread and wine which will become the Body and Blood of Christ. In Orthodox liturgy, we believe that heaven has come down to earth and we are united to heaven. Thus everything is spoken of in such terms. We are told to “lay aside all earthly cares”.